Each profile is based on sound science. The research highlights four areas important to performance: how we think, involve others, inspire the people around us, and get things done. Each of these areas is made up of key behaviours which the questionnaire you completed measured at different levels. Your profile and coaching comments, which tell you how you can improve your performance, are based on the consistency with which you use each behaviour as well as the level at which you use it. Remember all behaviours can be developed and the Development Planning section enables you to choose a behaviour to work on. There are two options for accessing reports. Either – Delegates can be emailed a link to view their report or to down load a PDF copy. Alternatively –The coach or sponsor receives the report and controls the timing of the receipt of the report to the delegate. PDF copies are then also sent to the sponsor, together with any requested team reports. What reports do participants get? My360plus doesn’t stop with a paper report. Participants get access to a fully interactive personal development site to explore their profile, decide on their development goal, to share with their network, for ongoing feedback. My360plus is a unique, four-part development tool. The online feedback process leads naturally into practical continuous development so the investment in the 360 is fully realised over time. Participants receive a personalised digital report (pdf) with clear explanations, an integrated workbook, coaching tools and action planner. They can set short- or long-term development goals and invite feedback from their observers. Strengths-based. The report uses strengths rather than meaningless numbers, with easy to understand visuals of participants’ results. Excellence benchmark. The report benchmarks the participant against people with similar roles, operating at high levels within that role. Addresses limitations. It reports on limitations objectively, so participants know where to prioritise immediate development, as well as longer term growth. What’s the Personal Development Plan? My360plus offers participants a year-long development plan. After the participant receives their report, they can set individual development goals for each behaviour, to their own timetable. The development plan includes a social feedback option. The system asks their observers to continue to give feedback; this can be via the tool itself – as free form comments on the executive dashboard – so participants can easily see it. Social feedback means ongoing feedback from the people that the participant nominated to give in the initial survey feedback. They are asked, by the system, whether they want to continue to support the participant. System prompts. The system prompts them to give feedback over the period of the participant’s development goal. Observer choice. Observers can use the my360plus system, email or talk to the participant about their feedback. Participants can read up on the wealth of coaching tips included in the my360plus system. Objective content. My360plus provides an objective starting point for a feedback discussion with a line manager, project sponsor or coach. Stand-alone or integrated. Coaching and feedback can be stand-alone, or part of a wider coaching or leadership development programme. How is the benchmarking table calculated? The data presented is built up of 15 years of profiling people from around the world, sorted into levels of experience. It is important so that you can position your profile against your level of experience. Research shows that as we gain experience and are exposed to more complexity and change, we tend to develop more high performance behaviours. What does benchmarking tell me about my development? If your profile is relatively undeveloped compared to others with similar levels of experience, this may indicate important development needs. Remember that no one has strengths in every area and the more experience of complex leadership roles you have, the more likely it is that you will develop behavioural strengths. Why look at different observer groups responses? It’s interesting to look at differences between different observer groups as this may show how you change your behaviour depending on who you are working with. You may for example behaviour differently to your boss than you direct reports. How are the different statements grouped? The system analyses statements which describe each Behaviour as a strategic, advanced, basic and negative levels. The statements are grouped in this order, with strategic level questions in darker green at the top and negative level questions in red at the bottom. Are statement levels the same as ratings? No. Your profile ratings (developing strength, strength etc.) are a complex analysis of all statements at all levels, which takes both the level and consistency of your behaviour into account. How do I use my own report? At the bottom of each page there is a ‘suggested’ next page which you can go to, although you can use the section icons above to jump to any section. How do I get a hard copy of my own report from the online system? The candidate can either select the ‘print page’ button at the bottom of each page, or alternatively download one or more sections (you can select which sections you need) by clicking ‘download PDFs’. What kind of reports do people get? 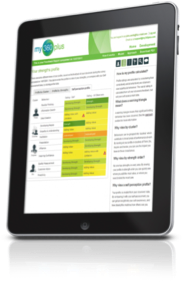 Each individual receives a full online feedback report, downloadable as an A4 formatted PDF. A valuable developmental document, with an objective profile of the individual’s strengths based on the observations of their colleagues. Each report contains a clear profile of the individual’s strengths, together with explanations and coaching suggestions for each behaviour measured. The individual has access to the my360plus system for 12 months allowing continuous use of the social feedback and development planning function as well as the ability to re-measure. The organisation receives: a PDF report for each participant, plus any requested team profiles. During the administration of the questionnaires, automated progress reports are always available. How is my profile calculated? Profile ratings are calculated by considering how consistently and at what level your observers saw a particular Behaviour. The overall rating in calculated from all your observers feedback, but not your self assessment data. What does a warning triangle mean? Behaviours can be grouped into ‘clusters’ which contribute to broad areas of performance at work. By looking at your profile in clusters of Think, Involve, Inspire and Do, you can see the impact you have on these broad areas. Why view by strength order? No one has strengths in every area. By viewing your profile in strength order you can quickly see where you add the most value, or where you need to take the most care. Why view a self-perception profile? Your profile is created from your observers’ data. By comparing it with your self-assessment, you can get an insight into your self-awareness, and how closely this matches how others see you. My360plus offers additional reporting options to help you get the most from your investment. Team reports can be for any size of team; they aggregate individual data to profile any group or team. Team strengths and gaps. This means that organisations can see where the strengths are across the team– and where the gaps lie. Flexible and scaleable. My360plus is scalable and flexible for small or large numbers; there’s no minimum or maximum team or organisation size. My360plus can demonstrate the ROI of your development project. Great value. Within the 12 months subscription period it is possible to do a second full survey for only 50% of the original cost. Assessment AND Development. My360plus is a unique, 3-in-1 assessment, social feedback and development tool. Measure ROI demonstrate progress and value in terms of high performance, talent or leadership development. Is the 360 feedback report anonymous? The purpose of a 360 degree survey is to get feedback from more than one viewpoint. We recommend a minimum number of colleague and direct report observers so that you can’t tell who gave the feedback. Of course, your own, and your Line Manager’s (boss’s) feedback is not anonymous. In the my360plus survey it is also possible to add feedback categories, such as “Customers”, which increases the number of observers, although bear in mind that customers see you at your best, not in the heat of everyday situations! Some people say they are willing to forego the anonymity in order to get the feedback they need, for example from a smaller team or group. The key challenge is that anonymous feedback is more objective and feels less personal than when you know who the feedback is from.